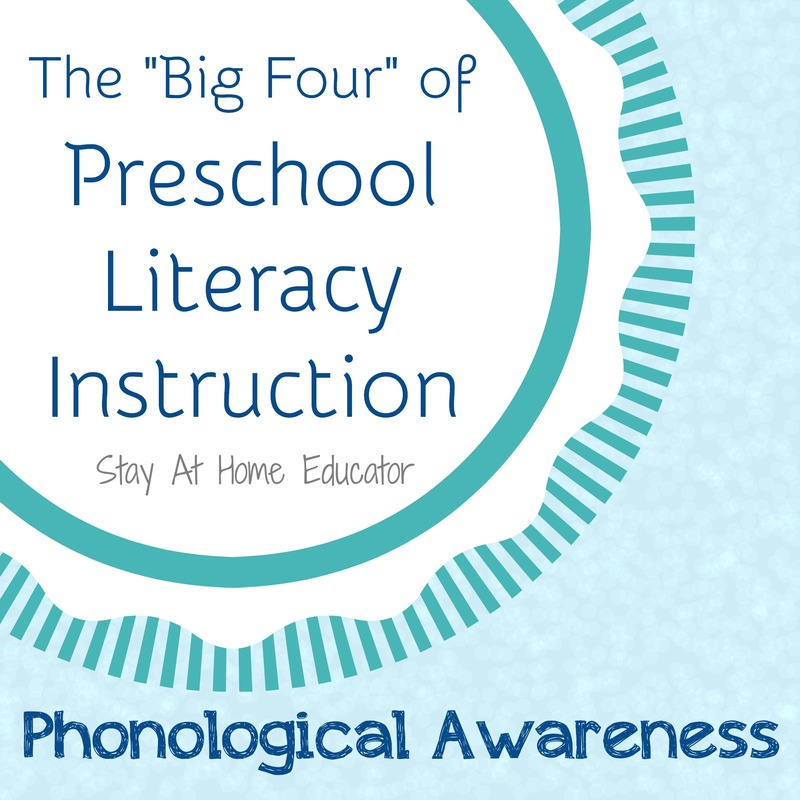 This is the second of a four post series about “The Big Four” of preschool literacy instruction. These four components to a complete literacy curriculum in preschool are print awareness, oral language development, the alphabetic principle. and phonological awareness. Each post in the series will explain what each component is, why it is important to preschool literacy, and what teaching strategies can help develop these skills, as well as a list of books and games that help develop each pre-reading skill. This series is appropriate for all teachers, parents, and caregivers. Please join me regularly via E-mail in the right sidebar, Facebook, Twitter @StayAtHomeEdu, and Pinterest to stay updated on the latest posts. What is the oral language development? 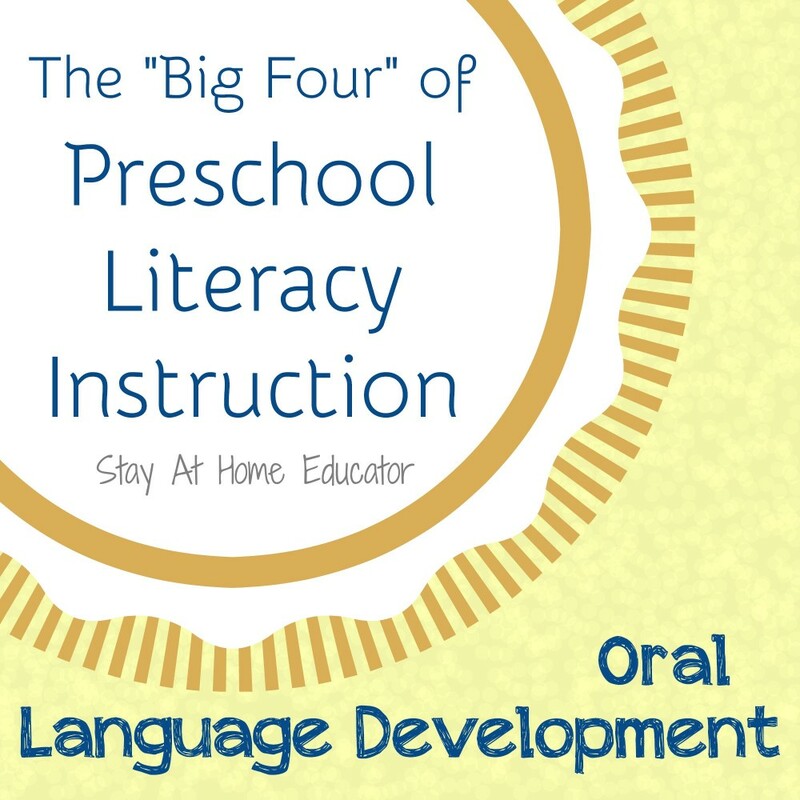 Why is oral language development important to early literacy? Proficiency in oral language provides children will tools for thought. Without fluency in speech, children find it difficult to learn and interact with the environment around them. Like other emergent reading skills, oral language development is a strong indicator of later reading success. Children who enter formal schooling with large and vast vocabularies are better prepared to learn how to read, as well as better prepared to learn through reading and being read to. Children how have strong oral language skills tend to be strong readers and writers, as trend that follows them throughout grade school. How can oral language skills be developed? Parents, caregivers and teacher play an active role in oral language development. Providing children with an environment rich in language will help develop language skills. This begins by adults active listening to children in their care, as well as teaching children how to listen and respond to oral communication. one of the most valuable things parents, caregivers and teachers can do to develop oral language skills it to build the child’s background knowledge of various topics. In addition, the following are some ways in which parents, caregivers and teachers can nurture language development. What are some books that can help develop oral language skills? For your convince, I have included some of our favorite books and products related to building oral language skills via affiliate links. Any purchase of these books go directly to maintaining this blog. I recommend these books because of lyrical text that is vocabulary rich, or because of the rich and dynamic stories they tell. Yet, these books are still of high interest to young children. Promoting Oral Language Development by Audrey W. Prince, M.Ed. What are other products that can help develop oral language skills?